2 1/2 x 4 Rolled Blank Scrolls Package of 5 | Blank Scrolls | Scrolls Unlimited, Inc. 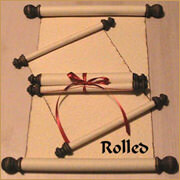 These rolled scrolls that are made with parchment paper and stained walnut finials. They are great for group activities, special events, or class projects. They come with a rubber band and ribbons for tying and securing rolled scrolls.